I know it's been a while... sorry. 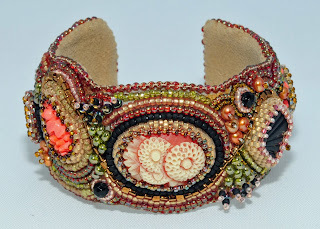 But I have to share this with you: http://beads-perles.blogspot.com/. 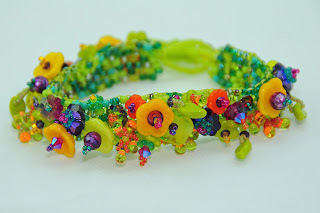 I was interviewed by Beads-Perles! The top of the interview is in Spanish but you can scroll down to read it in English if you'd like. I know that it's been forever and a day since I last posted but I've been really busy. Beyond busy- taking inventory, packaging new beads, writing my book, doing taxes (ugh). I'm trying to get all of my ducks in a row before the Bead Fest in Santa Fe which is rapidly approaching. The kits area all ready to go but I don't know if I am. I'm still unpacking from Tucson! Though, I am looking forward to returning to the southwest. I feel right at home in there, especially in Santa Fe. I love the cuisine, the artwork, the weather, the people. The city inspires me so much. 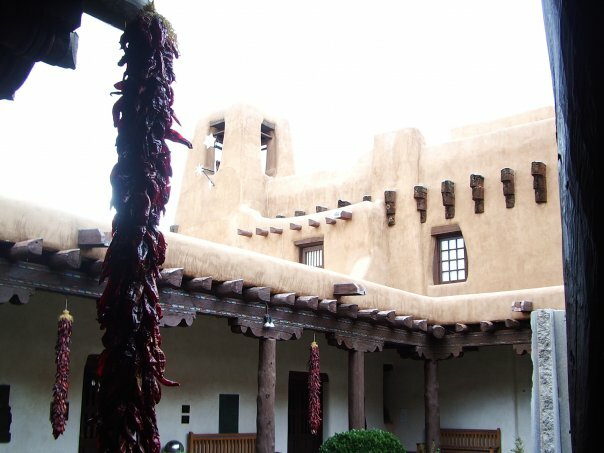 Above is a shot I took a few years back while visiting the Santa Fe Museum. I highly recommend taking the time see some of the museums and galleries while you are in town, if you are planning on going for Bead Fest. If you are going... why not take a class with me! 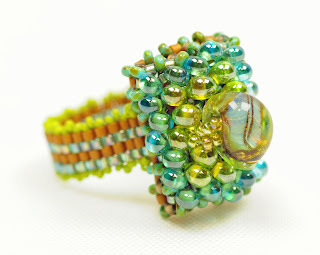 I still have spots left in my Tempting Tassel, Happy-Go-Lucky Cuff and Bubble Ring classes. For details please visit: my class page on the Bead Fest Website. You will need to scroll down past the text to view my classes. Doesn't it temp you to take a class? In the meantime, I dream of having some free time to dedicate to my poor, lonely and often neglected guitar. I miss her so. Here are some photos of my new seed bead set-up at Waterlily Studios in Florence, OR. It's been way to long since I last posted. Forgive me. Sometimes life just gets in the way! I have been busy moving my seed bead shop out of the antique mall and into a beautiful bead store, Waterlily Studios & Beads. What a beautiful, inspiring space it is. It's a perfect fit for my seed beads. I had to buy new racks for my set-up and I think they worked out well. The most time-consuming part of the endeavor has been the inventory process. I've been counting tubes of beads for many days now and I'm still not done. I have even been dreaming about counting them in my sleep. I promise to post a picture ASAP! I brought my camera with me the day I finished my set up and the battery was dead. Doh! I'm getting ready to head down south for Thanksgiving. I'm really looking forward to spending time with family and taking in some sunshine. I will be teaching at Beadology in Huntington Beach, CA. On Fri. Nov. 25th I will be teaching my Bubble Ring where students will learn to combine Right Angle Weave with Peyote stitch to create a groovy, bubblicious ring for their beady little fingers. Previous experience with RAW is recommended and highly encouraged. On Sat. Nov. 26th I will be teaching my freeform embroidered cuff. Students will learn embroidery techniques including peyote bezeling and finishing off with ultrasuede. Both days I will be having a trunk show featuring my kits. Yep, you too, could spend Black Friday at a Beadology with Beadologie! It's that time of year again, folks. Time for the annual Portland Bead Society Bead Bazaar, which really is a fantastic show. The show is held inside an old Montgomery Wards building at Montgomery Village, right near the Silver Cloud Inn, which is where I stay. It's conveniently located within walking distance of many cool shops and great restaurants. I look forward to it every year. Plus, with the season changing, there are always lots of leaves to crunch through along the walk! I will be selling seed beads, kits and supplies. I've got a nice supply of new colors and specialty seed beads so, be sure and check 'em out! The hours are Sat. 10-6 and Sun. 10-4. P.S. Click photos to bigify.